A dazzling design for your winter wedding! This information card's gorgeous border of snowflakes and flourishes mimics the look of gold glitter, silver foil and rhinestones that sparkle. 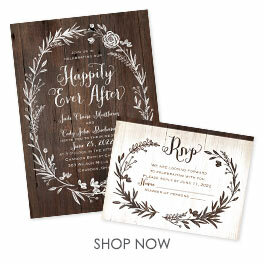 The background is printed in your choice of color with white flourishes. Personalization Options: Flourishes are printed in faux gold glitter. Snowflakes are printed in silver. Your wording is printed in your choice of colors and fonts.